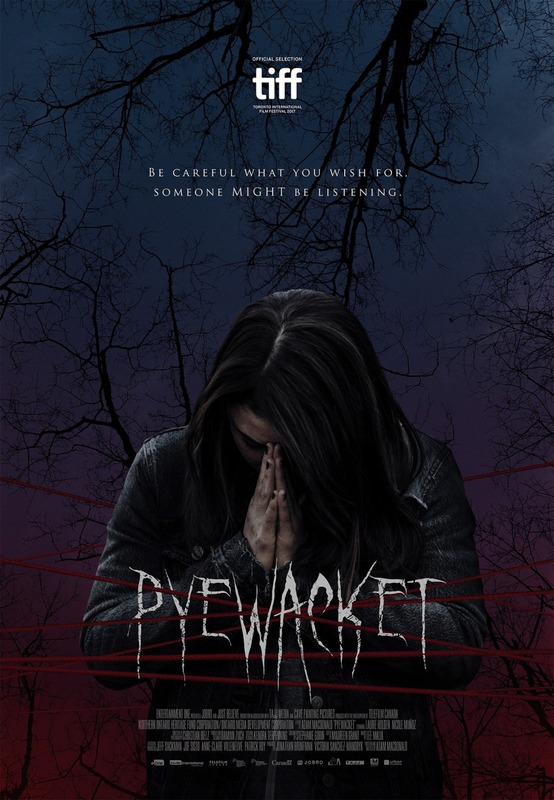 Chrichton's World: Review Pyewacket (2017): Interesting horror but it needed a bit more! 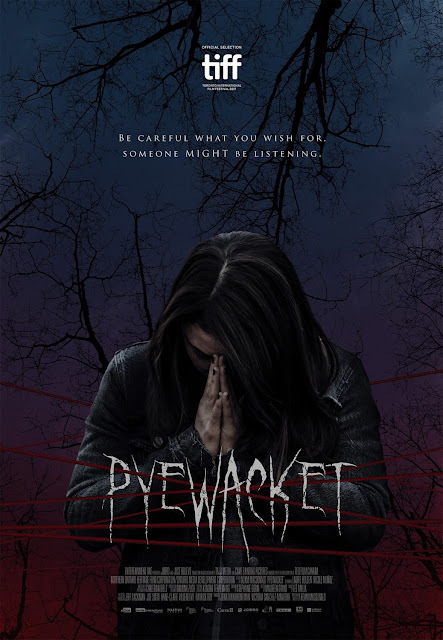 Review Pyewacket (2017): Interesting horror but it needed a bit more! Before I start I do have to state that for the most part I liked Pyewacket. But at the same time this film lacks quite a few elements that could have made it a whole lot more compelling. Pyewacket excells by instilling terror by showing very little, not using music and sounds and other typical elements to frighten you. In this case the lack of these elements helped to create dread. However where it fails is that too many times convenience takes over. Leah has many opportunities to discuss things with her friends but apart from one time she barely says anything. Even at times when an event occurred that was very upsetting to her she kept her mouth shut. I don't want to judge too much since it does seem she is a little introverted or just too scared of what people might think of her. Then again she is extremely passive into taking her relationship with Aaron to the next level. I mean even in a scene where both wanted to kiss they both waited for the other one to actually do it. However events do besome do dire, dangerous and pressing you start to wonder why she is so hesitant. Now I did consider that she is troubled and frustrated about her father's death and how her mother deals with it. But these friends already shared the same interests and were curious about witchcraft and all that. Granted she was made fun of. Still this can be explained that she did all of this on her own without ever consulting or discussing this with her friends. But another example is when she finally confides them and convinces a friend to come and stay over. Something happens and instead of actively visiting her, questioning her or persuading the other friends to try to talk to her, she only is texting her. To which she doesn't get a reply. This friend by the way has a very extreme reaction. Again I don't want to judge and certainly anybody would be spooked or startled. But she doesn't utter one word after. It's all too convenient. The relationship between Leah and her mother (Laurie Holden / The Walking Dead) is strained to say the least. Both are heavily in mourning and they kind of blame each other from not truly supporting each other. Although the mother is incredibly unreasonable and almost very selfish. There is a high psychological element you can sink your teeth in. At times it's even implied that whatever is happening to Leah can't always be trusted. Is she imagining things? Due to grief or stress. Or is she just plain insane? Or are the events real and it's the Pyewacket playing tricks on her? The ending can be interpreted in many ways and is a bit sudden. It doesn't give you a proper ending as I would like to. For example the film neglects to give insight into what other characters think of the events concerning Leah. There is too much information and context missing. To the extent that the ending also feels very convenient. And I was disappointed that Pyewacket was far too subtle in one scene particular. Here was the chance to magnify the dread and terror. No matter what the cause it was the ideal moment to scare the bejeezus out of everybody. Even if you would just view this film as a psychological drama you need more to make it compelling. More conflict, a deeper look into the dynamics between Leah and her mother, or how Leah is perceived by her friends when she is not around. Everything is shown from her perspective and there have been films where this could have a significant impact. In this film this is not the case. As much as I wanted to Pyewacket simply doesn't give you the substance that is needed. I don't want to chastize the director but since he also wrote the script I do think that he has been a little lazy. Whatever his true intent was he fails to deliver on many fronts. The good acting by Nicole Muñoz is what saved the film from becoming bad. Laurie Holden in my opinion could have done a lot better. It seemed to me that her face was to plastic for her own good. It prevented her from showing the emotions she probably was expressing. Overall Pyewacket is interesting but needed much more on many fronts to make it truly compelling. As it is right now it's quite average and less sophisticated. And therefore quite disappointing. If you don't expect too much then Pyewacket could be entertaining. If you were hoping for genuine horror goodness this just doesn't deliver.